Martin Namasaka is a regional communications coordinator in Pact's Kenya office. There was a time when the Turkana people of South Omo, in northern Kenya, lived in so much fear and conflict that the region was essentially a no-go zone. Today, though, Atok and her children are thriving. Much of the progress is the result of the work of the St. Peter’s Community Network, also known as SAPCONE, a Kenyan organization that promotes coexistence and access to education through peacebuilding, community partnership, and sustainable livelihoods. Pact began supporting SAPCONE in 2014 through the PEACE III project. PEACE III is a five-year, USAID-funded regional conflict transformation program implemented by Pact and Mercy Corps. The program is building stability in the Horn of Africa by strengthening the horizontal and vertical linkages within and between local, national and regional conflict management actors. PEACE III strengthens local cross-border conflict management systems and improves the responsiveness of regional and national institutions. In addition to providing funding to carry out its work, Pact has provided SAPCONE with training, mentoring, strategic organizational strengthening, and more. Armed with improved resources, innovative approaches to peacebuilding, and a strong understanding of the region’s conflict dynamics, SAPCONE has become a leading peacebuilder along the Kenya-Ethiopia border, helping to transform lives here. With strengthened institutional capacity, SAPCONE has successfully facilitated inter-community cross-border peace dialogues to encourage peaceful coexistence and sharing of grazing pastures, as well as forums to educate youth against engaging in conflict and behaviour that can drive it. This has transitioned youth, including some who used to stoke conflict, into agents of change and peacebuilders in their communities. “The challenges that we have encountered since inception have largely strengthened and enabled us to continue making a positive impact in our communities through our peacebuilding initiatives in one of the most volatile corridors. With the help of baseline information that SAPCONE got from PEACE III, we got a clearer picture that enabled us to move with more determination. We started to implement both intra- and inter-community peacebuilding activities between Kenya and Ethiopia,” says Amfry Amoni, SAPCONE’s executive director. SAPCONE’s peace dialogues have led to the development of social contracts in the form of informal cross-border, inter-community resource sharing agreements. One example is the sharing of Lake Turkana between the Dassenach and Turkana communities, whose conflict over the years destroyed local livelihoods. SAPCONE helped establish a fishing committee of 30 people between the Dassenach and Turkana that quickly resolves any conflicts that erupt. 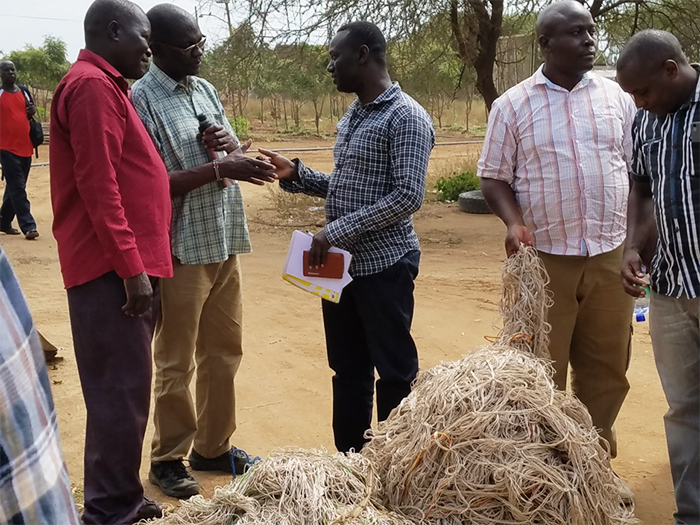 As a result, fishing revenues have stabilized and some fisherfolk now sell to the World Food Program to help feed the Kakuma refugee camp in Turkana. Pastoralists are now diversifying their incomes through fishing, increasing their resilience to drought, and fishing communities have launched village savings and loan associations that have boosted their incomes, helping members to pay their children’s school fees. “If not for the dialogues and agreements to stop the violence of the past, we could not have come back here,” says Atok, the widowed mother. She is a member of a SAPCONE-established Turkana grassroots women’s forum, which is engaging women from the Dassenach community in Ethiopia in promoting peaceful coexistence and sharing of the lake resources. With support from PEACE III, SAPCONE is also working to eradicate clannism as a cause of internal conflict among the Turkanas. The network’s early warning systems, driven by local peace monitors who track and report insecurity incidents, helps to mitigate internal conflicts between the Kwatella and Ngissiger clans that are driven by petty theft of livestock, rivalry over grazing zones and watering points, migration patterns, and climate change effects. This has helped to reduce violence because most planned attacks are forestalled before they happen. SAPCONE’s growth has also contributed to strengthened conflict management capabilities for women, youth, kraal elders, and chiefs. All are now taking a more active part in peacebuilding, especially women. Inter-community women leaders’ forums between Turkana and Dassenach women, for example, have helped reduced border tensions after armed raids, with members stepping in and encouraging their husbands and youth to reconcile. SAPCONE has also helped facilitate reunification of families. Last year, for example, a 9-year old Dassenach boy got lost while herding and strayed into Todonyang, in Turkana. He was found by a Turkana kraal elder who took him to a SAPCONE peace monitor, who helped get him home. 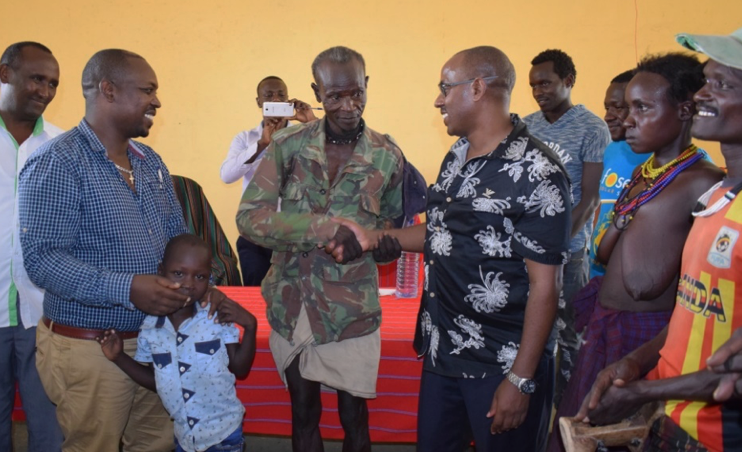 His family thanked the Turkana elder with a gift of two cows. Although challenges remain and progress can sometimes feel slow, SAPCONE with the support of PEACE III is making a difference. The network’s peacebuilding approaches have helped decrease insecurity between the Turkana and their neighbors, including the Dassenach, the Nyangatom, and the Toposa of South Sudan. Davis Wafula, SAPCONE ‘s Head of Programs, recalls a time when cattle thefts were rampant – a part of the local culture. Today, Davis says, they are far less common, carried out only by the most determined “peace spoilers” looking for profit. “Through PEACE III, space for the spoilers has been greatly minimized," he says. "It’s only a matter of time before their activities are completely neutralized."